Published in Rafu Shimpo, November 23, 1955. 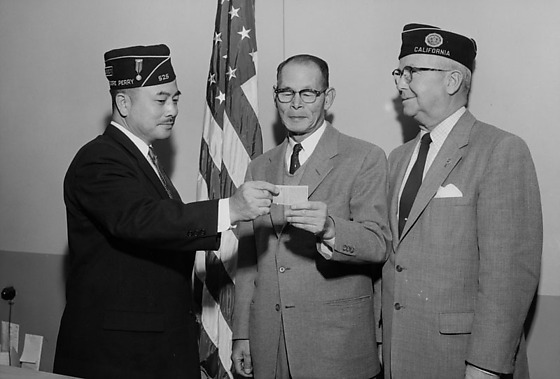 Two men representing the American Legion present the first certificate of achievement to new citizens to an older man, Katsuma Mukaeda, Los Angeles, California, November 16, 1955. Municipal Court Judge John F. Aiso stands at left in a dark suit and a "Commodore Perry" garrison cap handing a card to an older man in a suit and eyeglasses standing in center. An older Caucasian man, Fred W. Miller, chairman of American Legion naturalization commission, stands at right in a suit and garrison cap. American flag on pole stands directly in background. Typed on original envelope: American Legion Publicity at Small Claim's Court. The rest of the certificates were distributed at the November 18, 1955 event by the American Legion.